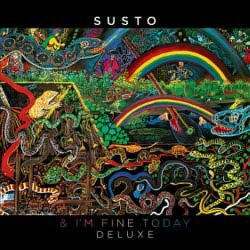 Charleston, South Carolina-based Susto embrace numerous genres as their music and lyrics dive headlong into the mind of the listener, their new album “I’m Fine Today” following their 2014 self-titled debut. Possessing an addictive draw, the band are fronted by lead vocalist Justin Osborne and guitarist, and songwriter Johnny Delaware, and are aided by Corey Campbell (guitar, bass, keys, backing vocals), Jordan Hicks (bass) and Marshall Hudson and Wolfgang Zimmerman (drums, percussion). I became enthralled, as early as the opening track Far Out Feelings. Although they could have made more of the song, better is to come in Hard Drugs, only to lose me on the next cut Waves (which has too many layers of sound) as they start to fly, wild and unattached. While it isn’t a bad song, it’s as if they feel the need to clutter up the song and over cook it. I guess some people prefer it that way, but I tend to shy away from the like, unless something different or a classy groove is offered, and here there is neither. Gay In The South is a brave effort, and with more progressive alternate rhythms it breezes along as harmonies warm the authoritative lead vocals. Diamond’s Icaro digs in nicely. The gritty approach on vocals lends depth to the song, and with a restless rhythm featuring keyboards a rare beauty is present throughout. Mountain Top is a shade or two darker. Set to a sombre, piano led rhythm it has him speak of been on the Blue Ridge Parkway (North Carolina mountains) and making it to the top at sunset and being rewarded by the beautiful view. Mystery Man has a wistful feel. That of being back on earth! You never quite know what to expect next from Susto. Here, the music enjoys a gentle country rock edge. Plus it also has the feel of wide-open spaces, only this time you are out in the west or out on the open road enjoying the freedom of it all as a welcome breeze blows against your face. Cosmic Cowboy has a little more to it than the over used title suggests. Here, he speaks of being a Southern man, and how is he forever going to find a peaceful place in the world. During his sabbatical, originally to get away from music he visited Cuba, not unexpectedly Osborne dropped into the music scene, hence the song Havana Vieja. To a degree he keeps it simple on the warm melodic reflective ode Wasted Mind; splashed in smart evocative sounds it is one to chill out to, and have a drink as you become lost in the inviting lyrics. Osborne knows both how to write a positive lyric, and reflect on life and simultaneously produce a good hook. Final track Jah Werx helps underline the diverse nature of Susto; a unit who enjoy more than a little experimentation without I hasten to add ever going a step too far. Alternative Americana, complex and artful.